Thanks to Ken Meyers and Keith Shaw (now both AMA Hall of Fame members) for all the work and effort continuing the country’s oldest ongoing electric fly in. The Mid-America Electric Flies. 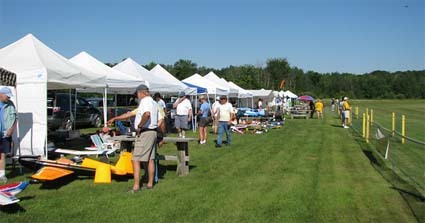 This years event was held July 7 & 8 2012 and is usually scheduled the weekend after July 4th holiday. This event is a gathering of friends and is attended by many builders. The group is full of electric flyers that were working hard at making electric work since long before it was cool or easy. It’s always a great time. Sunday included an award for the Radical RC 1905 Wright Flyer kit “1st Place CD’s Choice” award. All of us at Radical RC appreciate the award and recognition. It’s such a fun airplane to fly. Several people at the event flew the model including Keith Shaw who is now the proud owner of a kit. He reports to me this is only the 8th kit he’s purchased in his lifetime. Keith normally makes his own plans or occasionally builds from plans scratch building nearly all of his models. We consider it a high compliment that our 1905 Wright Flyer kit will cross the same workbench as a lifetime of award winning and hobby expanding projects Keith Shaw has completed. This entry was posted in Blog Entries, Event Commentary, Radical RC & Local Info and tagged 2012, America, ann arbor flacons, EFO, Electric, electric flyers only, Flies, Fly, Fly-In, In, Mid, RC. Bookmark the permalink.